This five-plate gold rush era panorama of San Francisco was sold at auction in the mid-1990s to the famed late collector and scholar, Matthew R. Isenburg. The severely scratched and tarnished centre plate existed for decades without a protective cover glass. To complete the panorama, I made a new plate to replace the hopelessly deteriorated centre image. The history of Sterling C. McIntyre's panorama and its restoration was published in The Daguerreian Annual 2013. Most of Southworth and Hawes' daguerreotypes were found unsealed in the grooved wooden boxes supplied by the plate manufacturer. This likely occurred in the 1860s when Hawes removed the plates from their original housings to copy them with the new wet-collodion process. Wood is a source for chlorine and over time silver chlorine compounds formed a disfiguring white haze. This daguerreotype posed a challenge. To preserve the delicate flesh coloured tinting, the solution to dissolve the silver chloride had to be applied locally. 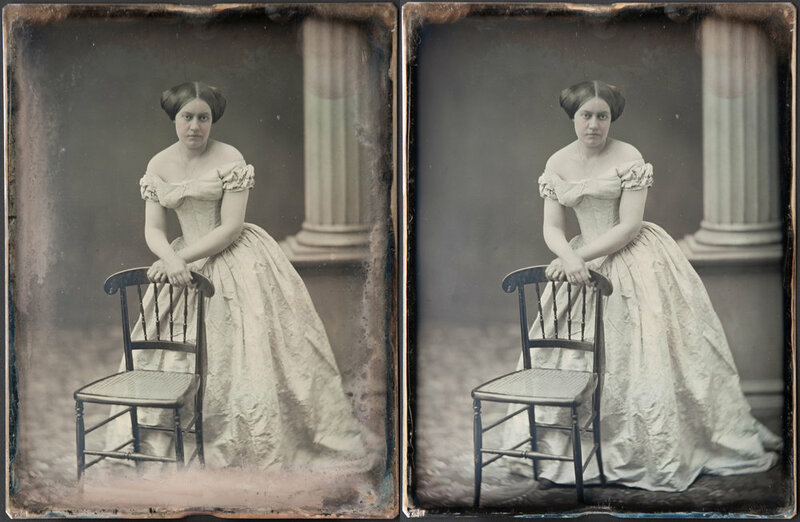 This is the right half of a full-plate stereo pair of daguerreotypes made for Southworth and Hawes' Grand Parlor Stereoscope. The left side, in pristine condition, was found unsealed in a tin box. This plate was in a wooden box. The obscuring white haze was analyzed and found to be silver chloride, similar to example 1 above. Extensive research was performed to unravel the mystery of the disfiguring white haze issue with Southworth and Hawes daguerreotypes. This research was published in Topics in Photographic Preservation 16, Journal of the Photographic Materials Group - The American Institute for Conservation of Historic & Artistic Works. 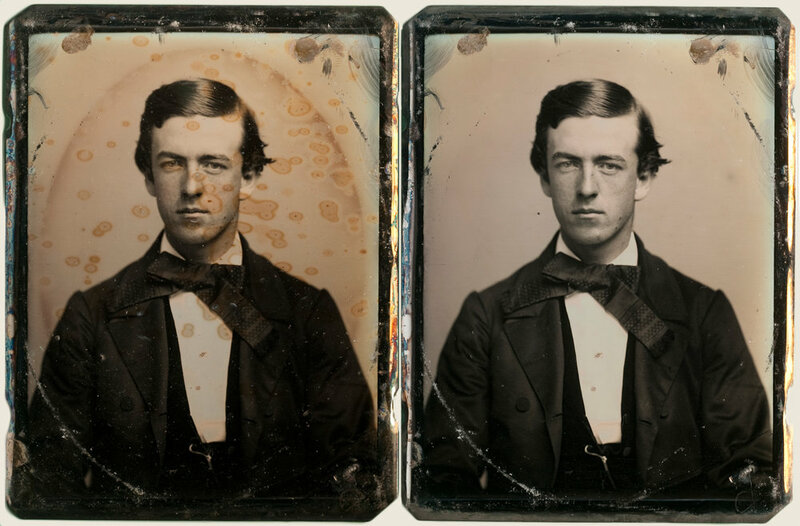 This daguerreotype was treated with thiourea in the 1980s. This a silver-dip solution dissolves tarnish, which certainly improves the appearance of the image, unfortunately, this also causes the dissolved sulphur to concentrate on discrete sites on the surface of the plate, which may or may not be visible black specks. Over time these sulphur rich sites form rings of tarnish surrounding the deposit site. Furthermore the gilding layer is corroded in proportion to the duration of thiourea treatment, diminishing the daguerreotype's contrast. Electro-cleaning, as in this example, effectively removes all the tarnish without harming the gilding layer. For further reading see this article. Atmospheric sulphur combines with the daguerreotype to form silver sulphide. Tarnish progresses from a light overall warm tint to dark brown, iridescent blue, and then black and image details become obscured as tarnish levels increase. The importance of intact sealing tapes to prevent this type of deterioration cannot be overstated. Secondary and tertiary housings are recommended for daguerreotypes with weak original seals. Tarnish can be removed electrolytically using carefully controlled current settings and solutions for anodic and cathodic electric current flow. 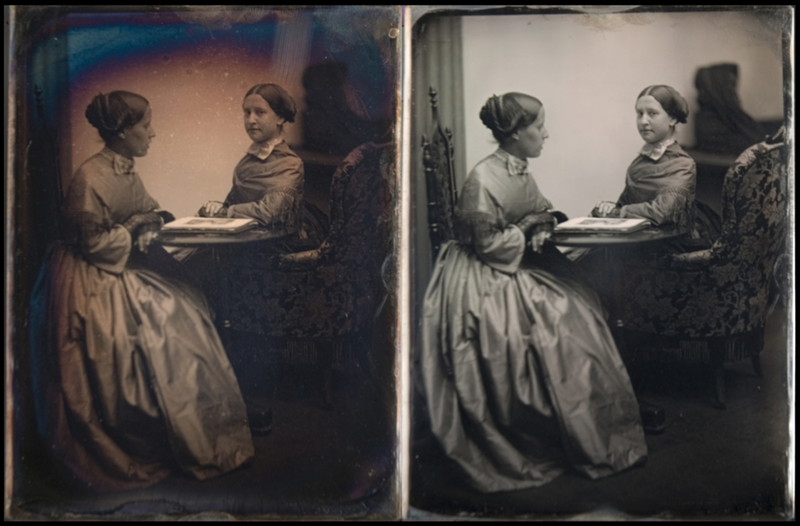 Very early ungilded daguerreotypes and daguerreotypes with applied colour cannot be treated by this method. This daguerreotype was part of the legendary sale of the David Feigenbam collection at Sotheby's in 1999. Stored in a Scovill wooden plate box for nearly a century and a half, the plate has the typical sulphide pattern that is heaviest near the parting seam between the lid and the box. Nineteenth century American made clad silver plates were prone to pinhole defects in the silver layer. This led some practitioners to galvanize their plates with a fresh coating of pure silver. Plates with pinholes in the silver layer develop green crystalline formations of copper sulphate when atmospheric sulphur combines with the exposed copper substrate. These defects can be dissolved in some solutions, however the original defect will remain. It is important that the plate be resealed after treatment to prevent further ingress of atmospheric sulphur.